We’re pleased to introduce a new title from Shannon Upton. 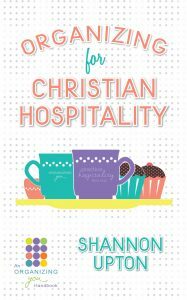 Organizing for Christian Hospitality is now available from Amazon.com! No matter how organized our homes are (or aren’t) we all harbor spiritual clutter that keeps us from hosting others. We consider inviting someone over, then dismiss the idea. We shy away from opportunities to host events. We think Christian hospitality is fine for other people, just not for us. 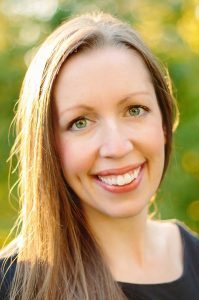 Christian speaker, blogger, and author Shannon Upton is here to help you clear the worry and anxiety that’s preventing you from welcoming guests and enjoying get-togethers. Shannon uses scripture, personal anecdotes, and concrete organizational tips to encourage you to relax your spirit and open your door. This handbook-length resource is available exclusively from Amazon. Members of Amazon’s Kindle Unlimited Service can also read the book for free with their subscription. Shannon Upton helps women use a little organization to clear out their spiritual clutter so they can grow closer to their families and the Lord. Shannon is the author of four titles, all released by Columbus Press. Her books have helped thousands of women to organize their lives and draw closer to Jesus. Find more great titles from Shannon here. Or learn more about her on her ministry website: www.OrganizingJesusMoms.com. Find all four of her amazing titles on Amazon.com here.